Home » Robeez Introduces Eco-Collection For Spring/Summer 2010! 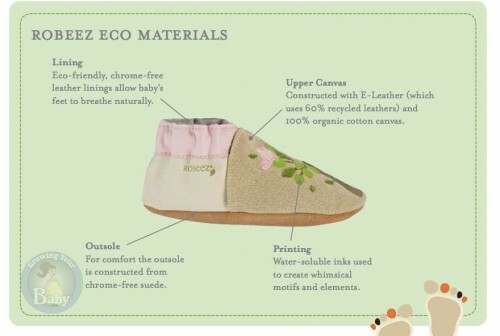 New for Spring/Summer 2010, Robeez has introduced a charming Eco Collection. The 1st Stepz line is designed with 30% recycled rubber, organic cotton, 60% recycled leather and water soluble inks, while the classic softsoles will features the aforementioned materials along with chrome-free suede on the soles and lining. As usual, the patterns Robeez has incorporated into the designs compliment the theme. The softsoles are printed with earth-like graphics including a frog, ladybug, tree and footprints.